The cathedral in Norwich was established in the early 12th century (the Bishop's See was moved to Norwich from Thetford in 1094) and is a fairly complete example of a Romanesque cathedral. The 15th-century spire in particular was admired. 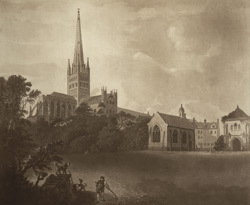 Daniel Defoe visited in the 1720s and noted of the cathedral: "it is a fine fabrick, and the spire steeple very high and beautiful." Certain parts of the building, such as the spire and complementary spirelets, were added to the basic Norman structure from the 1400s on.